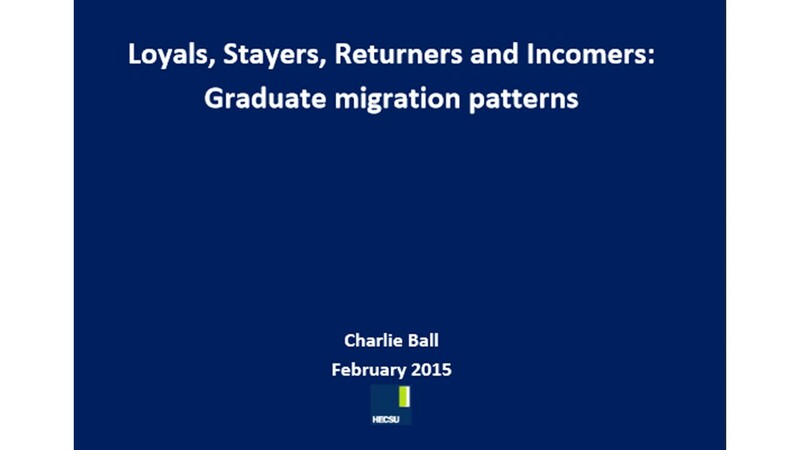 I have just read Charlie Ball’s excellent report: Loyals, Stayers, Returners and Incomers: Graduate migration patterns. I’ve been interested in Charlie’s work for some time, ever since coming across his earlier report into graduate migration patterns in the West of England. What this current report shows, as with his previous work, is that employment outcomes and graduate migration patterns are interrelated. So, for example, ‘incomer’ graduates (those who have not lived or studied in the region previously) have the lowest likelihood of being in a non-professional job, and returners (those who returned to their region of domicile after moving away for university) are the most likely to be in non-professional work. (those who move elsewhere to study, and then stay in the region in which they studied for work). The thing that strikes me is that almost three quarters of graduates stayed in, or returned to their home location after university. This raises significant questions for me about how mobile graduates actually are. Although in the policy literature it is often assumed that graduates are (or should be) highly mobile and willing to move for work, in reality the picture looks somewhat different. A final thing I noticed from the report is that Scotland is treated as one region, which is notable mainly for its very high levels of Loyals. However, I wonder if there is scope for a more detailed and granular analysis of Scotland by region. Given that there are significant regional differences in Scotland – with the central belt being the centre of population, employment and also of universities – I wonder if there would be significant differences between the mobility patterns of students in the central belt compared to other areas? Categories: Uncategorized | Tags: Charlie Ball, Graduate, graduate mobility, incomers, Loyals, migration, Returners, Stayers | Permalink.